lol!! I know! Me too! Ikr my cat is huge! 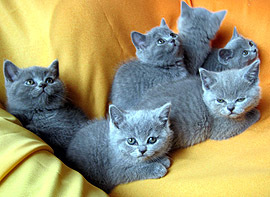 We love our British shorthair kittens. Right now we have 5 adorable kittens that are getting to be very playful! They’re almost 6 weeks old and ready for their first set of shots. My name is Winston. 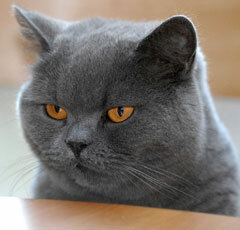 I’m British Shorthair. I live with an eclectus parrot of whom i tolerate. My owner loves me and thinks i am the most beautiful pussycat!!! Winston, you may be beautiful, but don’t let your owners be fooled: you’re sure to be the boss! Recently had a cat (turned out to be British Short Hair) show up at my door whining because it was cold. Absolutely gorgeous cat (no one has claimed)! Believe it is male. Currently have a female calico(not spayed yet) both are about the same age. They are playing and getting along well, but unsure since Calico is not spayed yet what I would end up with? Intend to get both fixed, but Calico still to small, was a runt. Can anyone tell me what they would look like if they were bred? I have had two amazing British Blues – got the first, Dumpy, when I was a child and he lived to be an astonishing 22 years old He had great presence and personality – rather a gruff English Colonel. The second, Tessa, was a loving, serene, smart and very maternal cat.They are the absolute best family cats, because they are affectionate but never demanding. We have had Oscar our Blue BSH for just over a year, he is getting a big boy now, we have just bought another BSH, he is a Blue Colourpoint. Tempermant is very d.ifferent, he is much more friendly. we love them both very much. Check out Oscar’s diary on youtube, in search type “oscarthewildcat”. I have a Grey and White one with Green Eyes, her name is Sophia, was fortunate enough to adopt her from the animal shelter, she is such a blessing for myself and my family, she will be 10 yrs in Aug, she comes in at 14 lbs. She is so calm, has all the traits of a British shorthair, so adorable.